We are a small friendly sheepdog training and trialling club. We are headed by a committee of 9 sheepdog loving people who give up their time to organise and run a mixture of sheepdog trials and training sessions in the South West. Our aim is to provide a good day out. Whether you are accomplished handlers looking for the challenge of an Open trial, or a novice handler who wants to improve your own skills and working relationship you have with your dog, hopefully, we have something for you. Some of you may never wish to step foot on a trial field! That’s fine – we aren’t all heading for the Nationals and the sense of achievement when your dog works well for you back home is satisfaction enough. If you are interested in joining call us on 01934 732661 – or fill in our membership form. You can download a copy here. The Somerset Sheepdog Club has changed a lot since it first started over 25 years ago. Early members would probably be dismayed that there is such a ‘competitive’ edge in the world of sheepdog trialling, but we all have to move with the times. Rules are strict and competitions taken very seriously – there is a lot at stake for ‘would be’ champions. However, The Somerset Sheepdog Training and Trialling Club has a good heart and aims to encourage and support all members who are keen to learn the skills that remain true to the original goal of a good working dog that will listen to his master. Our club is a good place to start and can help to improve your working partnership with your dog. There is nothing more enjoyable than talking sheep, dogs and trials over a cuppa and a slice of home-made cake – always in abundance at our events. We have made good friends within the club and hope to make many more. So if you are interested in some training for you and your dog or coming to a trial in the South West – give us a call on 01934 732661. Membership runs from April to April and entitles each member to run their dog at all Somerset trials and receive our regular newsletter. Any membership fee not received by end of June will result in membership being cancelled. 1. Your dog needs to be under good control before competing in a trial. Any dog abusing sheep will be called off the course immediately. The welfare of sheep and dogs is paramount.2. For SSTTC trials, you will be allowed to leave the post, but your run won’t be judged or points awarded and your sheet will read ‘D’ for disqualified. You can continue with your allocated time but if your dog grips, sheep leave the course or sheep are hassled in any way, the judge will ask you to leave the course.3. 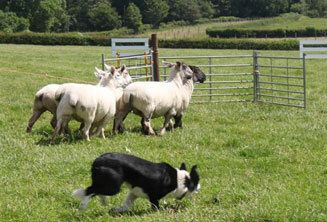 PLEASE NOTE – All placings won at a Somerset Club trial may now be valid at other Sheepdog Clubs. To avoid confusion, always check their rules before entering.4. If you have competed in a Drive course in Somerset Club and been placed, you are not permitted to run in a Maltese X Nursery trial. This applies to Devon & Exmoor Sheepdog Society but please check rules at other clubs before entering your dog. 5. Any handler whose dog damages sheep will be liable to pay the cost of the damage. 6. The Judges decision is final. Any dispute should be put in writing and not discussed on the trial field. 7. Verbal abuse of the judge or any committee member will lead to immediate suspension of that member. For those of you who are not quite at the stage of venturing onto the trial field, or are in need of some extra practice on different sheep, Rich has been running some informal sessions on a Sunday morning. Groups have been small – just 1-5 handlers each session and have proven very popular. If you are interested in coming along then please give us a call – be great to see you. Sessions will be free to Somerset Club members. Start 9.30am. Entries on the field in person please, before 12 noon. Entries will be limited to 2 dogs per handler. Entries on the field in person please before 12 noon. Entries will be limited to 2 dogs per handler. Refreshments available. There will be a raffle so donations of prizes would be much appreciated. Start 9.00am. Entries on the field in person please, before 12 noon. Entries will be limited to 3 dogs per handler. Our Annual General Meeting this year will be held on Tuesday 16th April at the Rodney Stoke Inn on the A371 between Cheddar and Wells. Good parking facilities. We last met there a few years ago but since then it has become a member of the Butcombe Brewery Family. Good Beer! Please do come and have your say. there will be a light supper so let us know if you can make it. We’ll look forward to seeing you there. Subscriptions for 2019/2020 are due from 1st April 2019. Members are requested to contribute their subs as soon after the AGM as possible, please. Many thanks. Copyright © 2012 by Somerset Sheepdogs. Powered by WordPress.